Some European countries are advising people to stockpile a minimum amount of water and food in case of emergencies. This certainly makes good sense in a rural area like Somerset. Our civil contingency plans recommend looking at two weeks’ supplies before normal services can be resumed, in a general worst case scenario. We’ve had the mains water cut off before. If you’ve got enough bottled water to last a whole fortnight, it’d be easy to cope for a day or so. Where could you keep it? Any dark place will do – under the stairs, in the loft, out in a shed. Be careful in a loft as the floor is not safe to walk on, nor strong enough to hold full water containers. You’ll have to put planks across the rafters. The five litre (gallon) bottles are the best ones to keep. 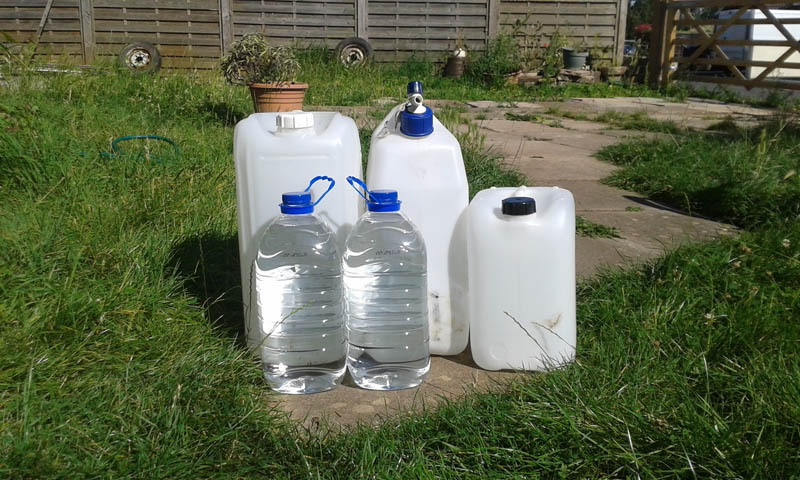 The empty containers will be useful if the authorities bring a bowser or outside tap. Ideally you should have two litres of drinking water per person per day. For a fortnight, seven of these large bottles each will do. This is quite a lot of storage for a family of four! If you simply haven’t the space for a full supply, keep a couple of the 25 litres (5 gallon) plastic water containers as well, such as people use on caravan holidays. Store them dry and empty; keep a bit of hose and a funnel with them as they’re hard to fill up from a sink tap. You’ll probably get some warning if the mains supply is going to fail, so you can get these full before it does. Make sure your bath plug fits and fill this up too. Extra water for washing would be nice! Remember full baths can be dangerous for small children. Add a couple of buckets and a large jug to your list and you have an excellent emergency kit to cope with quite a long interruption of mains water supplies.